I did your week's grocery shopping, wasn't that nice of me? Reach inside this bag and see what delicious treats I've bought you! PSYCH. The bag is actually full of venomous spiders and now you're dead! I really got you, huh? You can't appreciate this now (seeing as you're a corpse), but I got the idea for my cool spider prank from something that actually happened (art imitating life, yet again). 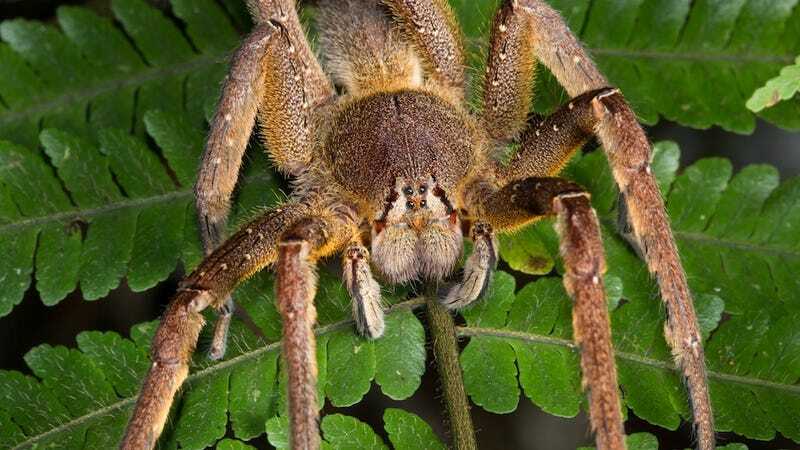 A woman in Colchester, England was recently surprised when she found a banana packed with the eggs of the Brazilian wandering spider, one of the most poisonous and aggressive spiders in the entire world, in her groceries. The woman initially thought her bananas were spotted with mold, but, after prodding them, she realized that it was actually an egg pouch. The cocoon then split open, covering her floor in spider eggs. Abby Woodgate, 30, was told by pest control experts that she would have to burn anything that had come into contact with the spider eggs, as the arachnids are highly venomous. At deadly concentrations, their venom causes loss of muscle control and breathing problems, resulting in paralysis and eventual asphyxiation. The Brazilian wandering spider has a tendency to hide in banana bunches or plantations and is occasionally found as a stowaway within shipments of bananas, hence its other name – banana spider. The woman ultimately vacuumed up the eggs, then had her vacuum incinerated by animal control. Too bad you can't burn this story from your brain.